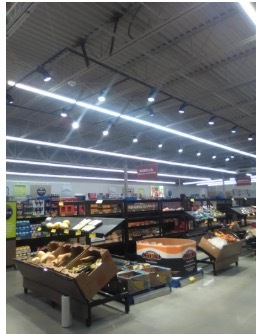 FLOWERY BRANCH, Ga., (November 22, 2016) ­– A Fayetteville, N.C. location of an international grocery chain recently had energy-efficient, LED lighting installed throughout its sales floor. Prime Retail Services of Flowery Branch, Ga. coordinated the installation as a part of a larger-scale remodeling of the location. In addition to the lighting package, the scope of the project also included fixture installation, graphics installation, and painting. Prime is also in the process of remodeling several other locations for the same international grocery chain.